Love can make your mind do crazy things. But if there’s one thing that’s true, you’re not alone. In John Cariani’s brilliant new comedy Love/Sick, a series of nine short pieces explore a litany of pairs’ exploring love through the various stages of relationship in an assortment of hilarious and tender ways. With a pleasant mix of realism and absurdity, Love/Sick is a fantastic romance divided into nine distinct yet cohesive pieces. The play by Almost, Maine scribe is just as charming and heartfelt. From stories about impulsive love-at-first-sighters to a Singing Telegram Man to a man with conversion disordered caused by love, Cariani brings a wonderful blend of hilarity and sentimentality that allows you to drift away for an enjoyable ninety minutes of theater. Silly to desolate, Cariani gives you it all. The journey Cariani guides you on is quite brilliant and concise. While any of the nine plays could stand alone, together they form one thrilling cycle that examines relationships. With SuperCenter as a thematic tie in, the nine plays easily lived in the same world. The play cycle employs an eclectic quartet of actors to take on the assorted characters. Writer John Cariani, a late addition to the ensemble, does an incredible job stepping into his own little world. Cariani is hilarious with his timing and physical comedy. Joining Cariani was the delightful Dee Roscioli, the multi-dimensional Simone Harrison, and the down for anything Debargo Sanyal. With four actors in nine two-handers, they each had the great opportunity to play with each other. And it just so happened that the most enjoyable scenes were with Cariani and his scene partner. The energy playing off of the writer was electric and a thrill to watch. To bring this play to life, director Chris Henry discovered the nuances of Cariani’s stories and easily found the reality in the absurdity. With a rollercoaster of emotions, Henry captures the spirit with simple yet precise focus. Henry was able to bring out the truth from her ensemble. Her staging was exquisite but one of the best touches was the brilliance that was the scene shifts. 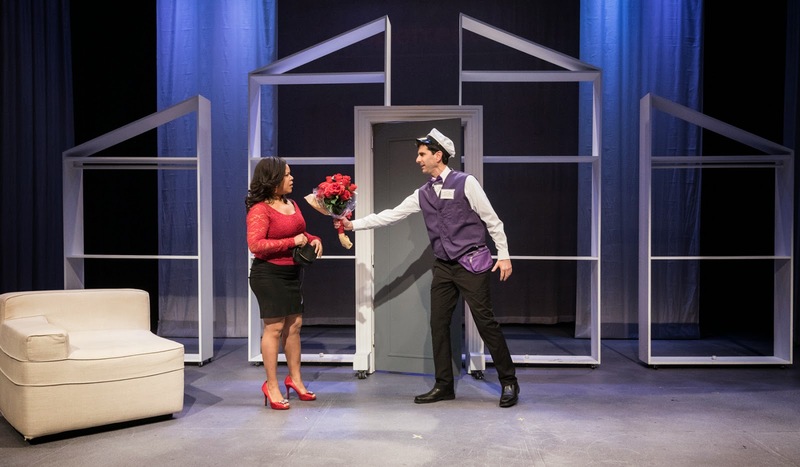 Scenic designer Shannon Rednour’s sleek set was not only mobile, it was transformative. Adding in brilliant and relevant music and choreography to the song and dance transitions made them exciting to watch. It was the perfect touch to tie in to the world of the play. The five dancers appeared just for the scene shifts, yet somehow became stars. And that’s an incredible feat. Lighting designer Lucrecia Briceno did a great job adding the right look for each scene and blowing up the color during the transitions. The costumes by Lux Haac allowed each actor to have a base yet a different look for their individual characters. The cohesiveness between Henry and her collaborators made this piece such a treat and something not to be missed. The pairs of characters in Love/Sick either make it or don’t. Fortunately, Love/Sick will definitely make it and last a long, long time. 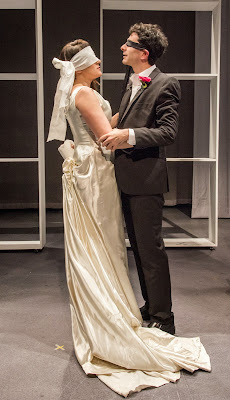 Love/Sick is refreshing, entertaining, exciting, and thought provoking, everything the theater should be.